Beverly Daniel Tatum is the author of the Epilogue and the current President of Spelman College. She is also the author of "Why Are All the Black Kids Sitting Together in the Cafeteria? And Other Conversations About Race" (Basic Books) and "Assimilation Blues: Black Families in a White Community" (Greenwood Publishing). Defining Racism "Can we talk?" The Complexity of Identity "Who am I?" The Early Years "Is my skin brown because I drink chocolate milk?" 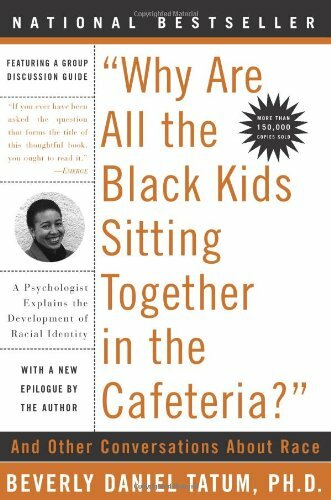 Identity Development in Adolescence "Why are all the Black kids sitting Together in the cafeteria?" Racial Identity in Adulthood "Still a work in progress..."
The Development of White Identity "I'm not ethnic, I'm just normal." White Identity and Affirmative Action "I'm in favor of affirmative action except when it comes to my jobs." Critical Issues in Latino, American Indian, and Asian Pacific American Identity Development "There's more than just Black and White, you know." Identity Development in Multiracial Families "But don't the children suffer?" Embracing a Cross-Racial Dialogue "We were struggling for the words."